Before we begin, a little technical background is in order. A digital image is composed of millions of pixels. Each pixel specifies color using three numbers, each indicating the amount of color in each of the three primary color bands: red, green, and blue. Every color in an image is represented by combining appropriate levels of red, green and blue for each pixel. Lower numbers indicate darker colors and higher numbers indicate lighter colors. values are present in the image. A JPEG image (like most image formats and most monitors) stores colors as three 8-bit values for each pixel. Many DSLR's and some advanced point & shoots can also record images in a "raw" format, which is essentially a dump straight off the camera's sensor without any in-camera processing. Like the sensors themselves, raw images typically have a higher bit depth, meaning they store colors using more than 8 bits per band. DSLR's currently use either 12 or 14 bits for each RGB band. Some digital medium format cameras record 16 bits per band. Each added bit doubles the number of shades recorded for each hue. A 12-bit image provides 4096 different shades per hue, while a 14-bit image provides 16,384 different shades. While the extra shades don't matter when printing or displaying an image on screen (the human eye can't appreciate the increase), they do allow you the flexibility to adjust the spread of these shades without causing posterization in ranges that have been stretched. More on that later. A "histogram" is a list of numbers containing one entry for each possible value that a pixel can have (256 entries for an 8-bit image). Each list entry counts the number of pixels in the image which contain that value. For example, a monochrome, 10x10 pixel image that is pure black (color value 0) with one white spot (color value 255) will have a histogram containing 99 in the "0" entry and 1 in the "255" entry. The more evenly distributed the color values are throughout the image, the more similar the values will be at each entry in the histogram. A very bright image, like a polar bear in its native environment, will have a histogram containing much higher values in its upper entries (200+). A very dark image, such as the night sky, will contain much higher values in its lower entries (below 50). To enable quick interpretation, we prefer to display histograms graphically as a vertical bar graph. Dark entries (low pixel values) are on the left; light entries (high pixel values) are on the right. The more pixels in the image that contain each value, the taller the vertical line will be at that entry. When space is limited (as when displaying the histogram for a 14-bit raw image), multiple adjacent entries are summed together and then displayed as a single bar. 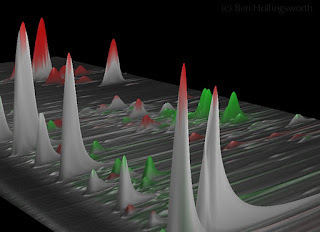 Peaks in the histogram indicate pixel values (shades) that are very commonplace; valleys indicate uncommon values. Enough theory--now for some real world application. The LCD screen on your camera can't be trusted to provide an accurate representation of the exposure for the image you just captured, especially in bright sunlight. 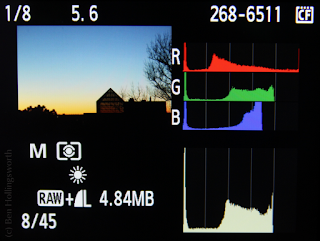 In order to see how bright or dim the exposure really is, you must consult the histogram. Most digital cameras--even point & shoots--have an option to display the histogram for a photo that's been taken. Many allow you to view the histogram for each of the three bands (red, green, blue) individually. With a quick glance at the histogram, you can immediately tell whether your highlights (high pixel values) are too dim or whether they're blown out, eliminating any detail. A histogram in which the values at the bright (right) end taper down to zero far below the right end of the scale indicates an image that has no truly bright pixels. Such an image will likely also have a high concentration of dark pixels, and the far left end of the scale will have a peak. There will be no discernible detail in most of these dark areas. gas chromatography data (my thesis research). A histogram with a perfect spread will have relatively even levels throughout the entire histogram, but then taper off right at both ends. This indicates no blown out highlights or empty shadows. 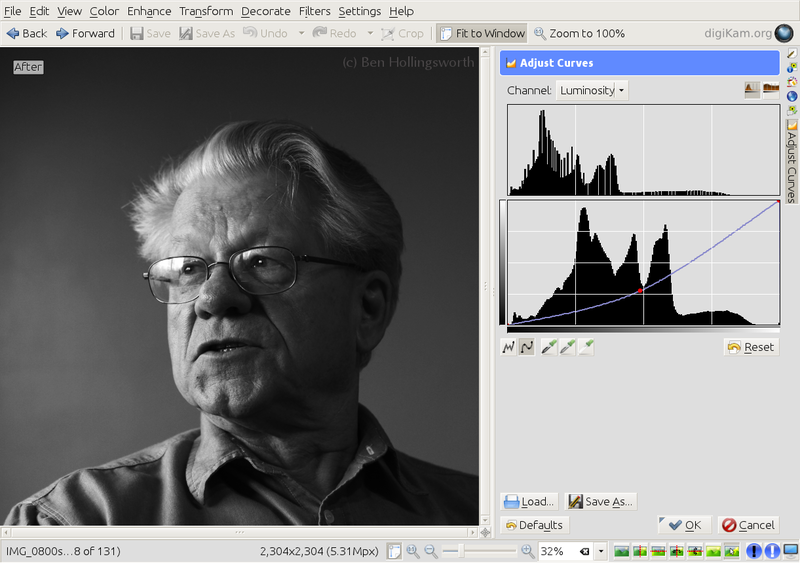 Of course, the desired look for a given photo may require large amounts of dark or light areas, so the perfect histogram may not indicate a perfect looking photo. The histogram is merely a tool to show you how your pixel values are distributed and whether you're likely to have lost detail at one end or the other. 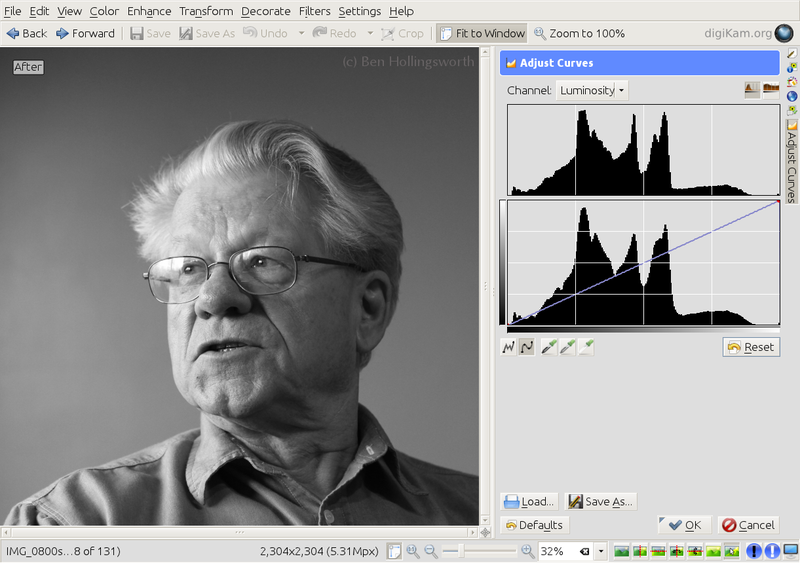 If your histogram indicates that you've blown out your highlights (a large peak at the right side), you can tell your camera to underexpose the next shot. This will pull all the pixel values lower, spreading out those higher values and leaving fewer pixels that are blown out. The result is more discernible detail in the bright areas of your image. Most photo editing software will allow you to adjust the brightness of an image using what's typically called a "curves adjustment." This tool displays your original histogram and allows you to draw a curve across it that redefines the brightness of each pixel value. 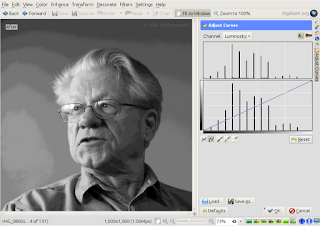 The curves tool uses a rectangular window to represent a 2D graph. 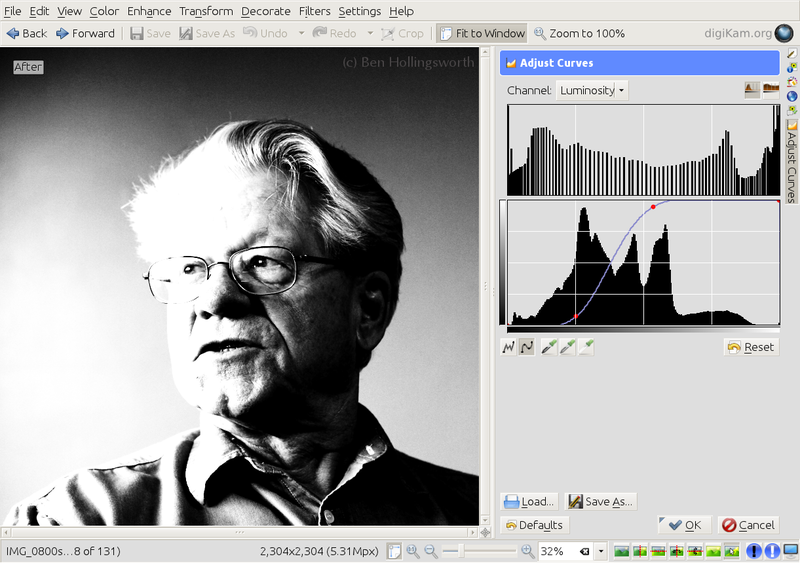 The bottom (horizontal) edge of the graph represents the original pixel values, and the original histogram is typically shown along this line. The vertical axis represents the new pixel values. The left and lower ends indicate dark values while the right and upper ends represent bright values. In the examples shown below, the newly adjusted histogram is shown above the original one. These screen shots were taken from Digikam, my primary photo management application. Same image, stretched contrast using curves. Note the posterization in the middle of the histogram. 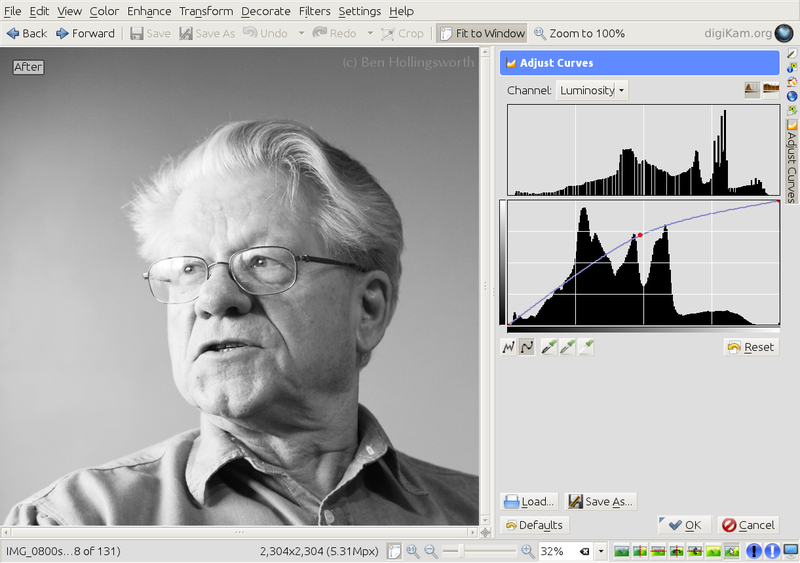 One popular application for histogram modification is to increase the signal to noise ratio or decrease the amount of sensor noise present in an image in order to create the cleanest image possible. Digital noise manifests itself as a random amount (positive or negative) that's added onto each pixel value recorded by the camera's sensor. The higher your ISO, the larger this noise value may be, and the larger variety of pixel values you'd get if you were to photograph an object of a single, solid color. Because digital noise is additive rather than multiplicative, it has a much more significant effect on darker pixels (those which have smaller values) than it does on brighter pixels (those which have larger values). Noise shows up as speckling in shadow areas, especially in high-ISO photos. If you increase these dark pixel values using a curves adjustment (a multiplicative operation), the noise will become more exaggerated as it gets remapped higher up toward the medium tonal range. If you decrease a noisy pixel value, the percentage of noise in the original pixel value will remain constant, but the total amount of the noise will be decreased because the pixel value itself is being decreased. Hopefully this has given you a better idea of what a histogram means and how you can effectively use it to improve the images you create. If you've got any questions, please speak up in the comments section below. My Master's degree thesis and several jobs I've held over the years dealt directly with this subject (re: the pretty red & green 3D graphics above), so I'm pretty familiar with how it all works. I've tried to simplify the subject for this article, but I can get as technical as you'd like if you've got more advanced questions. This article was originally written for Jedi.com in January 2009. This is great information. It will take me awhile to process it, but I thank you for pointing me in this direction.